Emergency services at the scene where a two car collision at the junction of Hollybank Road at around 6.30am took the lives of a woman in her 30s and a man in his 60s. 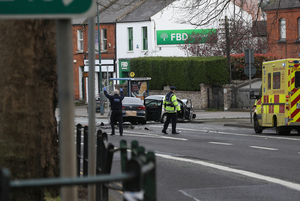 Posted in Misc and tagged crash, Drumcondra at 9:59 am on March 22, 2019 by Bodger. The speeds cars travel on that road before 7am (open bus lanes) is something to behold. Was just about to post same. I do some early mornings and am on the road at 6am. The speeds and sheer disregard for safety (red lights don’t exist!) Is frightening. Horrible for family and friends of both. RIP. Very sad and sadly unsurprising. Come on, people are dead, others have suffered a loss. Why the need to capture such an images and send it to BS to post on a website? Personally I think it’s a good idea to show. I noted the cars looked like they held up well after the impact and I’m sure many would probably assume occupants survived if they didn’t know. We may think our cars are built better and safer, which is true, but it’s not the cars we want to survive accidents. We’re not sure ourselves either whether these have merit or are appropriate, especially when there are fatalities, and would agree with both Dub Spot and Spud. Happy to put it out to the wider ‘group’ for their thoughts. FIGHT! Anything that gives us pause for thought, makes us slow the hell down and analyse how an accident may have happened is to be encouraged IMO. I would have assumed the occupants of those cars would have walked away, so the visual evidence reinforces the need for vigilance in our aluminum bubbles. Words can only do so much but the power of a photo can never be underestimated. If it makes people think a little more about the reality it’s got to send a stronger message to those that speed. Show the photos of the cars. As long as they are in good taste (like these) and not showing bodies or gore. We all need reminders of how fragile we are, and hopefully this kind of reporting may make some drivers more aware.